SIGNS IN LIFE begins with a late night encounter with law enforcement. In the harsh glare of a flashlight, author DEANNA NOWADNICK learns the consequences of speeding through a stop sign. Other incidents follow. All are linked to the divine signs she's encountered in that bigger journey through life. 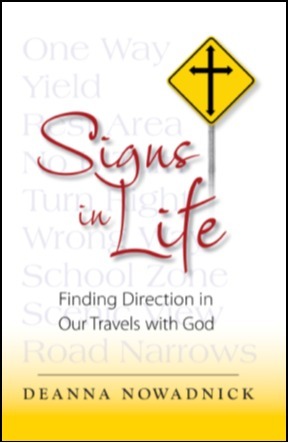 Join Deanna as she shares humorous anecdotes and inspirational lessons from her travels with God. See the signs in life. She might be speeding through a stop sign--yet again!--while you're carefully navigating a busy street, but together we're all part of a bigger journey, a greater purpose. We're all part of God's great story. What an inspirational book. I found myself reading along thinking, Yeah, I’ve missed that sign. Deanna’s look at her life direction through the use of signs she’s missed in her life will have anyone reading her book wondering what signs they have missed. I found myself identifying with her situations in so many ways. I often find myself asking God to help me, only to say to him, “here let me show you how.” At the end of each chapter she has a set of simple questions to ask yourself. I can guarantee you that if you read this book there is no way you will not be changed. If forces you to take a good hard look at your life and to look at those sign we often speed through trying to do things our way. This is a book that I think will benefit anyone and one I highly recommend. Thank you, Sandra! It's been a wonderful adventure. I appreciate your willingness to read and review. Blessings this day and always!